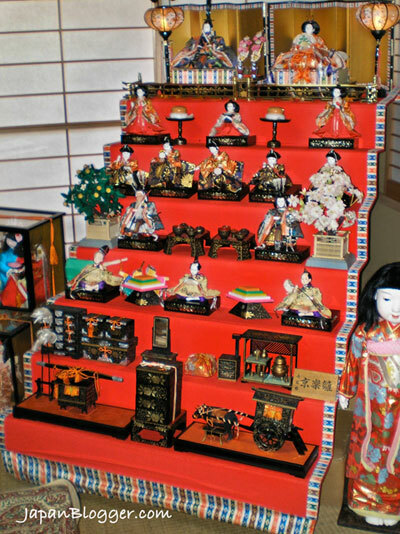 Also known as Doll Festival, Hina Matsuri (see pronunciation guide), and several others, Girls Festival is held on March 3rd every year (the third day of the third month). This festival is held to pray for a girl's happiness and continued good health as she grows into a beautiful woman. It was also traditionally held to pray for a girl's quick marriage into a good family. One of the first things that will jump out at anyone about girls festival is the dolls. It's known as doll festival for a reason, after all. As you can see from the photo above, these dolls are arranged on a tiered platform. The exact position of the dolls varies from region to region, but the dolls themselves stay the same no matter where you are in Japan. The top level holds the Emperor (Odairisama / 御内裏様) and Empress (Ohinasama / 御雛様). In this photo they are flanked by lanterns and in front of a folding screen. The second level is the three court ladies (san-nin kanjo / 三人官女). They are all holding sake. In this photo they have plates of sweets between them. The third level contains five court musicians (go-nin bayashi / 五人囃子). All of them have instruments except the singer. The forth level has two ministers (daijin / 大臣). The right is young and the left is old. In this photo there is a cherry tree and an orange tree to either side of them. The fifth level has the empress and emperor's samurai protectors, or bodyguards. Amusingly, they are drunk. In this photo there are rice cakes in between them. Finally, the bottom two rows have various decorations: some chests of drawers, a palanquin, a coach, a tea ceremony set, and some others. This doll set is very expensive and so many don't have the complete set that you see above. Traditionally, the eldest daughter would inherit the family doll set. We have Girls Festival, so do we have Boys Festival? Kind of! Return to the Japanese Festivals page to read more.